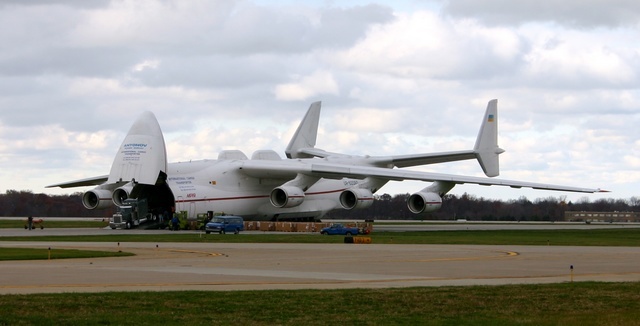 This plane is an Antonov An-225. It’s definately big and is not something Cleveland Hopkins sees all the time. It was carrying two 50,000 pound bearings destined for Austinburg, OH (near Youngstown) and had other cargo destined for various locations within the US. This plane is the largest transport aircraft in service throughout the world. More pictures can be found Here. This entry was posted on Saturday, November 8th, 2003 at 10:26 pm	and is filed under Photography. You can follow any responses to this entry through the RSS 2.0 feed. You can leave a response, or trackback from your own site.